The veteran director has crafted an immersive, old-fashioned thriller that manages to keep you guessing at almost each of its many turns. Last-minute Kevin Spacey replacement Christopher Plummer is the film’s surprise cornerstone. As the film opens, the camera flows along, leisurely taking in the mood, texture and detail of the 1970s Rome setting in which the wiry 16-year-old John Paul Getty III is taking a nonchalant nighttime stroll. He has the delicateness of his built and age but also the charm and confidence of being an outsider. He is an American in Italy but also, much more importantly, a Getty. Back on the Roman street, young Paul is approached by a duo of prostitutes. He asks for a bargain, they tell him to be careful. He can take care of himself, he tells them. A moment later he’s pulled in by a van of full of masked men, the door quickly bangs shut. This first scene functions as prototype for the multiple tiny contradictions and conflicts that make up the rest of the movie. Characters often act or speak, in direct opposition to what the audience is made to expect of them and from their circumstances. These then feed into the larger twists and turns of the narrative, some arguably directed by the hand of history, the rest by Scott’s steely charge. The film is inspired by the true events of billionaire oil magnate Jean Paul Getty’s favourite grandson’s abduction and his infamous public denial of paying a single dollar as ransom. What follows is a tussle between the boy’s mother Gail (Michelle Williams), who consistently choses her children over money, and the old man whom she has to persuade to foot the ransom. As the Paul’s life hangs in the balance, Getty, in a move to economise, sends his ex-intelligence security man Fletcher Chace (Mark Wahlberg) to Rome to find him. He becomes Gail’s unlikely ally. Scott drawing on John Pearson’s eponymous book (David Scarpa shares writing credit) does indulge in more than a few artistic flourishes, opting often for the cinematic over the realistic. The shifts from black and white to colour for instance, and a few exaggerated moments feel a bit unnecessary. So does a typical thumping heartbeat that sounds during one of the film’s climatic moments. But this treatment gives some hilarious (albeit tragic) moments, and also one of the most iconic shots in the film. Gail has thousands of newspapers bearing a tragic front page headline about her son, delivered to Getty’s estate — a taunt as well as plea for a change of heart. As the old man reaches up to examine the tremendous heaps of paper, one can almost envisage Scott’s cue for the wind to roar, inundating the sprawling mansion with a whole lot of bad news. The film does take an elaborate amount of time to set-up the action. There is a considerable journey through a flash-back, in which the life and times of the Getty family are fleshed out. But the investment does pay out. Seeped into the atmosphere of film, ploughed into the characters, one now hangs on to their every move and thought. Without this the manoeuvres and twists of the plot might have just fallen flat. It does feel that the film is built around Christopher Plummer, despite him stepping into the shoes of JP Getty only after Scott decided to remove any trace of Kevin Spacey from them, in light of his multiple sexual harassment allegations. At the outset Getty seems completely despicable, but due to Plummer’s layered performance and Scott’s craft in framing and extracting it from him (in just about 10 days) that one ends up sympathising with a man who seems beyond sympathy. Getty himself spells out his philosophy at one point — he likes things more than people, because people change and things don’t. Everything he has ever done, is to get more money than he has already. He is the capitalist subject par excellence, devoured by the money he has devoted his life to; an apt parable for times we live in. A reminder of all that is destroyed in the cannibalistic quest for amassing wealth everything that makes us human. People indeed change, as do the characters through the film’s duration. Change makes us volatile and unpredictable and dangerous, but the ability to adapt and evolve and to even defy everything that one has done for a lifetime in a heartbeat, also lends tremendous hope to the possibilities for a different and better future. 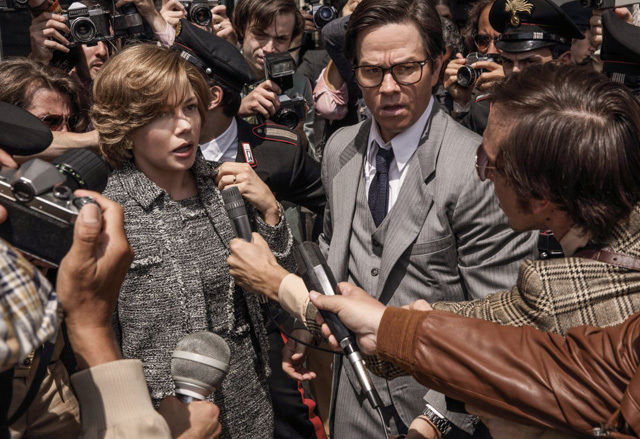 Michelle Williams puts in a strong, credible performance, as the mother forced to deal with her son’s kidnapping while putting up a fight against the Getty empire and a parasitic media. Wahlberg as the ex-spy however, in the lustrous company of Plummer and Williams, falls into the shadows. The character comes off a bit hollow and unrealistic but not to the extent of distracting from the film’s many merits Like every good thriller, this one constantly sets one’s nerves on edge. Respite comes only at the end, and even then seems ephemeral. As the film draws to its close, the colour palette is a harmonious but muted cream and blue. But it is an ominous, unsteady harmony as Gail stands surrounded by Getty’s wealth, and Ridley Scott has a final, eerie frame still to reveal. The film has received three Golden Globe nods for Scott, Willams and Plummer; the latter seems a strong, strong contender for the award. Catch it in a cinema near you this week, it’s worth all the money it asks of you.